NextWhat happened to the 30-day challenge? Metaphors and analogies are commonly used in systems thinking and complexity science to illustrate concepts that are, on their own, relatively complex and awkward to describe literally. A campfire provides both a metaphor for bringing people together, but also a literal tool that could be used more effectively in work with groups struggling to innovate, collaborate and contemplate together. From a design perspective, campfires and the social system that they create around them provide an opportunity to enhance intimacy quickly, allowing for the potential to explore issues in ways that are more difficult to do in other settings. A campire has been a beacon for human life for centuries and may provide the ideal analogy and literal tool to engaging people in creating new things. The opportunities for it to shape our thinking and actions is enormous. The campfire is a place where we go for warmth, intimacy, safety, light, food and inspiration. As camping season comes upon us in the Northern part of the Americas, it seems fitting to consider the ways that the campfire might be used to stoke the sparks of imagination and flames of passion (pun firmly intended). Consider some of the following properties of the campfire. Lighting has been found to have a strong environmental effect on many behaviours and moods, and the type of inconsistent light that is thrown by a campfire is similar to that which induces relaxation and intimacy (PDF). It can be argued that storytelling has been our most powerful vehicle for sharing what we know throughout human history. Research on narrative effectiveness has found that emulating the environments created by a campfire (PDF), the close-in, small-group, open dialogue sharing kinds of spaces, leads to more effective communication in business contexts. 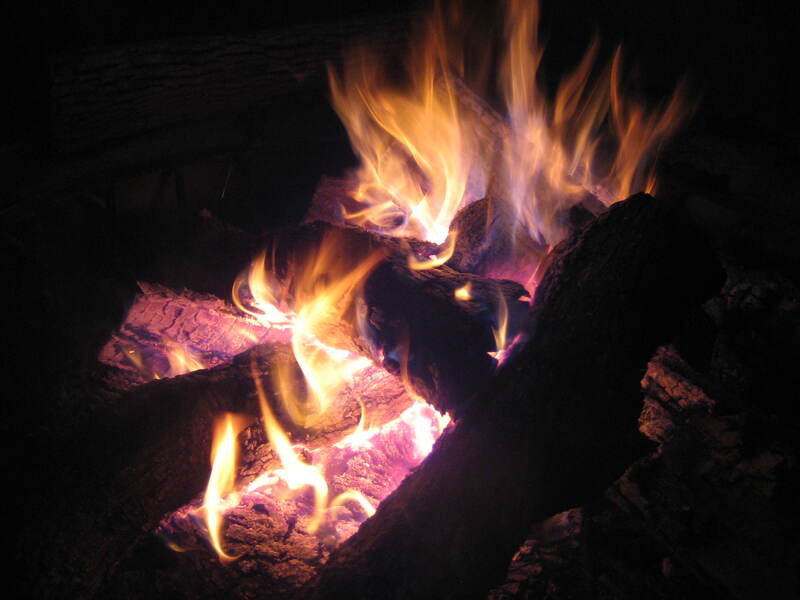 The sensory richness of a campfire — the smell of wood and smoke, the crackle, the sight of sparks and flame, the feeling of heat — all create an environment that differs from much of what we are used to, provoking psychophysiological stimulation that has been associated with learning outcomes. Research linking environmental design and architecture has explored the phenomenon of sensory richness and how modern designed environments reduce this and (potentially) limit learning. (See program example here). Another quality of a campfire is that it creates space for meditative inquiry. Anthropologists and psychologists have speculated that it was the campfire and the meditative rituals that it created that led modern humans to separate from Neanderthals. The focus on something like a fire draws attention away from the chaos of the world and channels into a circle that is generated through the campfire. One of the benefits of a campfire is the circle that it creates. Leadership scholar Meg Wheatley, Christina Baldwin and Ann Linnea reflected on their use of the circle and how it has been used historically as a means of creating a common space where participants are on more equal footing with one another as a means of leadership promotion. In a circle, everyone can (usually) see everyone else and no position is held as more important than others, which privileges all participants and not just some. Lastly, the campfire creates not just internal peace, but social intimacy as well. Indeed,modern social media has been compared to the campfire (PDF) in its ability to potentially replicate the focused, shared space that a campfire occupied for much of human life. For the reasons listed above, the social media effect is likely limited, but nonetheless the metaphor may partly hold in light of a lack of alternatives. In practice, lighting a chord of wood in the middle of an urban setting might be problematic, but it is worth considering for those of us looking to create those social spaces where people can gather. Taking a break and leaving town might be worth doing as well. Failing that, what are the campfire-like spaces that we can create with what we have. Designers, health promoters or anyone seeking to bring together ideas while working in complex spaces may wish to give this more thought — or meditate on it, which might (as it has done before) spark a new evolutionary shift attributed to the campfire. What happened to the 30-day challenge?